As many Catholic schools across the Archdiocese struggle to keep their doors open, St. Nicholas of Tolentine continues to swim against the current and succeed. The school, 3741 West 62nd Street, which has doubled its enrollment in the last decade, last week won the 2017 Croghan Teachers’ Award through the non-profit Big Shoulders Fund. The victory was secured when St. Nick’s students showed the greatest level of academic improvement—as measured by standardized tests and other factors—among all 77 Archdiocesan grade schools that receive Big Shoulders financial assistance. The announcement was made late last week in Hardiman Hall at the school by Big Shoulders President and CEO Joshua Hale, as students, parents, parishioners, administrators, faculty and staff cheered and high-fived each other. Hale, who praised St. Nick’s “great academic program,” noted that the award carries more than $82,000--$40,000 for school scholarships and the rest to be split among faculty and staff for their personal use, as a way of thanking them for a job well done. On hand to present outsized ceremonial checks were members of the Croghan family. The annual award was established more than two decades ago by Rosemary and John Croghan to honor and encourage excellence among Catholic elementary school teachers. 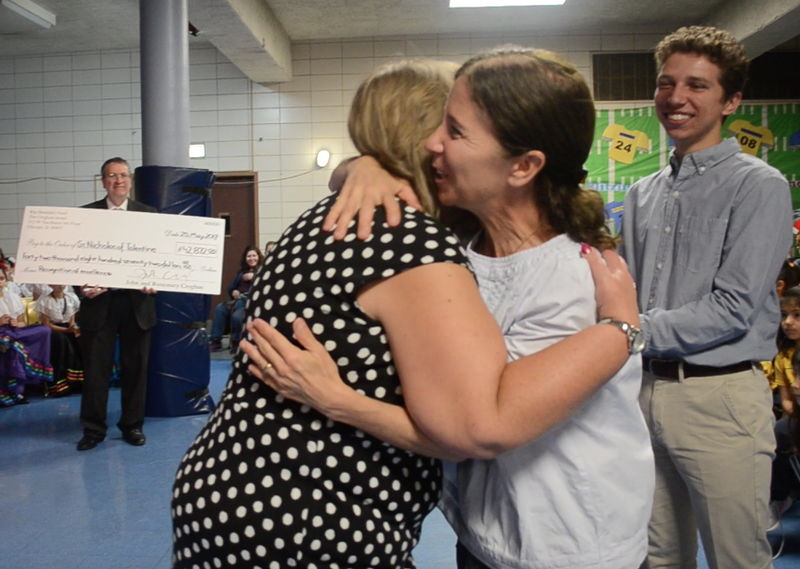 As several teachers wiped away tears of joy at what had been billed as a surprise announcement, Principal Dr. Mariagnes Menden accepted the award. Principal Menden (polka dot dress) accepts hugs from Croghan family members. When Menden came to the school in 2005, enrollment was at 190, not far from numbers that would have put it in danger of shutdown by the Archdiocese. Today St. Nick’s has nearly 400 students. Menden credits the success of the school to several factors, including the faculty and staff. When hiring new teachers, Menden said she looks for people who embody the mission statement of the school and believe in the ability of the students to succeed. St. Nicholas is also one of the few Catholic schools in the area to have additional resources for special-education students. Students are integrated into the regular classroom, while also having access to additional tutoring. Two thirds of the students at St. Nicholas are also English Language Learners, meaning that English is not their first language. Menden said the school also has a commitment to quality extra-curricular activities. Its music program has several levels of bands and choruses for students of all ages. They also have successful sports teams and try to integrate new sports every year.